Christening Cake. 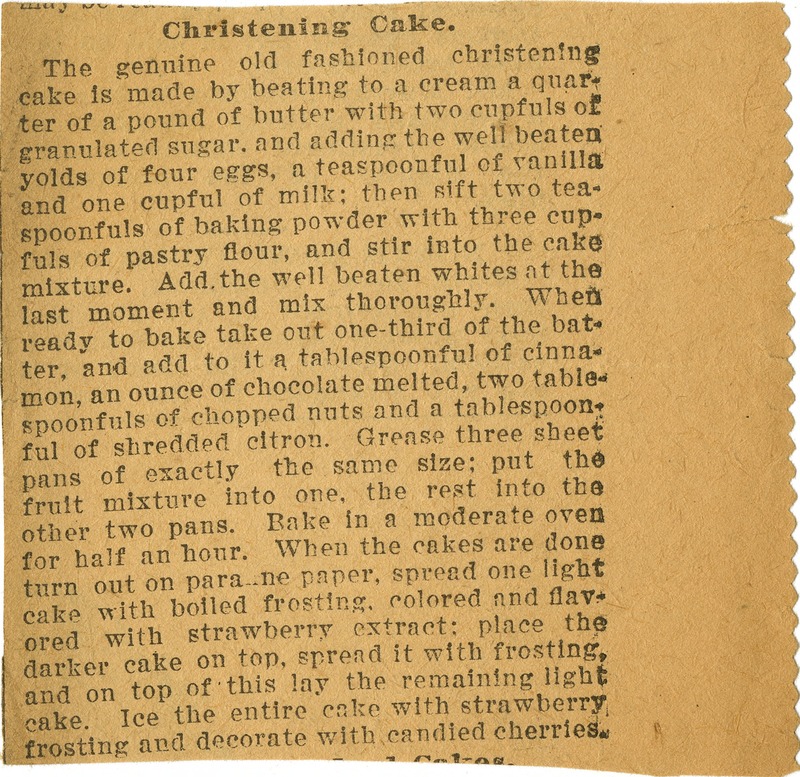 The genuine old fashioned christening cake is made by beating to a cream a quarter of a pound of butter with two cupfuls of granulated sugar, and adding the well beaten yolds of four eggs, a teaspoonful of vanilla and one cupful of milk; then sift two teaspoonfuls of baking powder with three cupfuls of pastry flour, and stir into the cake mixture. Add the well beaten whites at the last moment and mix thoroughly. When ready to bake take out one-third of the batter and add to it a tablespoonful of cinnamon an ounce of chocolate melted, two tablespoonfuls of chopped nuts and a tablespoonful of shredded citron. Grease three sheet pans of exactly the same size; put the fruit mixture into one, the rest into the other two pans. Bake in a moderate oven for half an hour. When the cakes are done turn out on parafine paper, spread one light cake with boiled frosting, colored and flavored with strawberry extract: place the darker cake on top, spread it with frosting, and on top of this lay the remaining light cake. Ice the entire cake with strawberry frosting and decorate with candied cherries.